Even the humble toothpick can have an exotic holder. While turning this clever container you will learn an ingenious technique for making a box with an inset lid. 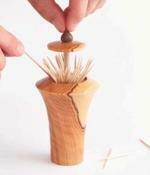 Wood and/or Supplies needed: We used olive for the body and walnut for the finial and cup. You can use any highly figured wood or laminate a body blank from two or more species. Tools needed: Lathe, and other common woodturning tools.